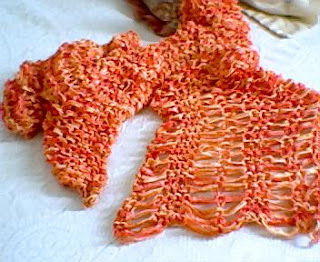 For no particular reason, I knit two orange-ish projects in a row. First is the scarf I made with the ribbon yarn from the Midwest Fiber and Folk Art Festival. I just cast on 20 stitches and knit until I was almost out of yarn. Then I dropped a few stitches at random and ripped them out all the way down. Unfortunately, the scarf looks a bit lackluster just lying there on my bed. The dropped stitches are much more pronounced and look really funky and messed up when the scarf is draped around my neck. Day before yesterday I was digging through my yarn stash looking for something else when I ran across 6 balls of Peaches and Creme cotton. I had purchased the Mason-Dixon Knitting pack a while back and used some of the yarn to make a couple of dishcloths and some bibs for my nephew. 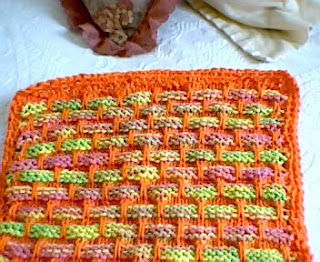 I made this dishcloth yesterday. I love that vibrant orange! It really makes the citrus colors of the ombre yarn pop. I have quite a bit of yarn left over, so I'm going to make another baby bib, this time for a former co-worker who is pregnant. She has purchased knitted items from me before, so I know she'll appreciate some hand-knit gifts. Love the orange...I'm in a real orange phase right now!